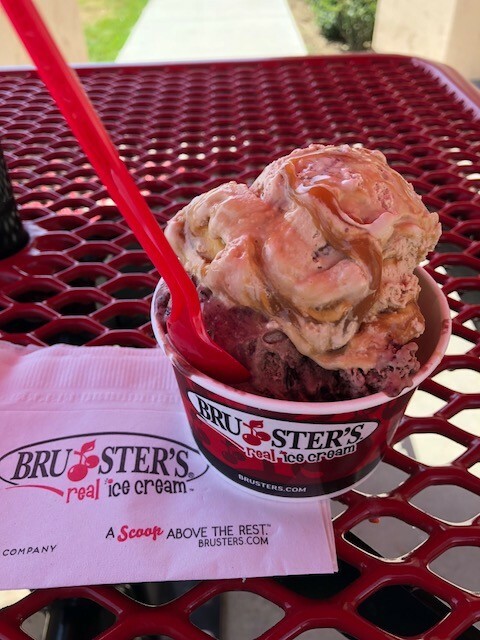 Home » All Forums » [Desserts Forum] » Ice Cream & Custards » Bruster's comes to TEXAS! Helpful ReplyBruster's comes to TEXAS! I was shocked and pleased to find that a Bruster's ice cream store has just opened in McKinney, TX. What's next? A Primanti's? A Double O? IC Light in the groceries and on tap? Collin County is one of the only places in the USA that has Five Guys, Culver's, and In-N-Out; this is the cherry on top of the sundae! This afternoon there's a waffle cone full of chocolate cocoanut almond with my name on it! Very bad information. We have one in Torrance!!! I'd never heard of them. Now I must go there. Ice Cream is my downfall. The only Bruster's I've ever been to is the one in Bridgewater. Not bad. We went to our new Bruster's and the product was indeed wonderful - and much pricier than I recalled from the 1990's when visiting my parents in New Wilmington, PA: $12. for two, two scoop cones (including tax and tip). The ice cream was intensely flavored and had a noticeably higher butterfat content than, say, Baskin-Robbins. Their store is an in-line walk-up (as opposed to the free-standing ones around Pittsburgh) in a new strip center. No seating, just a few chairs and tables set up in the sun with no umbrellas or misters. Their primary competition is Braum's, a chain of dairy & burger stores that sells an excellent product for less than half Bruster's price and provides comfortable, air-conditioned seating in which to enjoy it. Like several Milwaukee-style custard walk-ups and stand-alone's that have opened & closed here I believe that it is doomed to failure, despite the excellent product. They need to recognize that summers here are quite different than they are in Pittsburgh (or SoCal where I see they have a number of stores). Oh well, the Quaker Steak and Lubes failed here, too. That is their original location. I know. lleechef told me all about it. It's right next to Jerry's. But you knew that. My favorite Bruster's flavor is Fudge Ripple. Quaker Steak and Lubes? Is that a joke? I need a reason to go to Torrance! So many flavors! I'm partial to chocolate Raspberry flavor combinations. Braum's is very good. The have an occasional flavor of Maple Walnut that is excellent! I also like their rainbow sherbet. I'm easy when it comes to ice cream. Quaker Steak & lube is real. Unfortunately. But then again, I don't like chicken wings. Granted, I haven't been there since the '50s, but I can't imagine there could be any reason to go to Torrance. Quaker Steak & lube is real. I thought they'd be big hit in Texas, but the ones here were very poorly managed to the point where we stopped going. It certainly wasn't due to location, "ours" was at Preston Road and 121 (@ Stonebriar Mall) and Mar52 knows that it is almost impossible to fail there. Except they managed to. The last time I went to the Stonebriar Mall I realized that I really don't need a thing from Sam Moon's. The drive there on 289 from 82 is much more interesting than driving The 405 to Torrance. Guess who happened to be in Torrance today? A regular ($4.55 in a bowl) had 3 small scoops. Salted Caramel, Chocolate Raspberry Truffle and Banana Peanut Butter Ripple were my choices. Three scoops at Bruster’s equals two scoops at Baskin Robbins. Very rich with a high butter fat content, but I found it lacking in flavor. Had to try it! Glad to see you get a slice of home down there in McKinney MetroplexJim. Bruster's is good (chocolate raspberry truffle is my favorite), but when I get a hankering for ice cream, I drive right past the location five minutes from my house and go to Graeter's. During a stop of July 4th, the manager of the Graeter's told us they are putting a second location in the Pittsburgh area, this one in the South Hills. This will probably be much closer for Ralph and Lori. … when I get a hankering for ice cream, I drive right past the location five minutes from my house and go to Graeter's. Over the years I have noted that Graeter's has consistently been the most highly praised ice cream here on RoadFood. And, it has been lauded by RF'ers whose tastes I have learned to trust. As a result, Graeter's is on my 'RF bucket list' right along with a green chile cheeseburger at whatever the Bobcat Bite is trading as these days and New Haven pizza. As everything seems to 'pop up' in Texas these days I did a search for Graeter's and, sure enough, our local Albertson's, only a mile away, carries it! As we have a variety of groceries within two miles of our home (Tom Thumb/Safeway, Kroger's, Market Street, Albertson's, Whole Foods, Target Super-Center, and both a Wal-Mart Supercenter and a Wal-Mart 'Neighborhood Market) we don't go to Albertson's much. But, I am going there this morning! You live in a truly blessed area for food. Report back and let us know what you think of the Graeter's. I am not particularly adverse to eating at franchises and chain restaurants, I just won't go out of my way to publicize it on Roadfood.com . Don't you have any locally based ice cream shops in Dallas or Pittsburgh that can beat these chains? The last time I patronized Bruster's (ca. 2000) that is precisely what they were. And, until the other day, I had assumed that they had remained such. As it stands, they are hardly a "national" franchise. I was just surprised and pleased that a little bit of 'home' showed up here in McKinney, TX. That said, I have absolutely no objection to this thread being moved. Understood. If I grew up near Aliquippa I'd be thrilled to find my teenage hang-out show up near my present home. But if we take that to it's limit, everywhere there is someone who remembers when the latest chain-du-jour was the best local joint around. For the record, I never went to Culver's while working in Arizona. Raspberry Chocolate Truffle and Chocolate Raspberry Truffle are my favorites. I've now had Bruster's and Graeter's. I've had Graeter's at one of their locations and from a carton available in our markets locally. Bruster's just isn't as good in my opinion. Baskin Robbins ,but not often. … there is someone who remembers when the latest chain-du-jour was the best local joint around. Did I ever mention that I was a regular customer of the first Five Guys for years before they opened a second store? SE corner of Independence & Parker. Easy to find and not too far. Want to do lunch at Covino's and have Henry's for dessert? Sounds like a plan...I get every other Friday off now...How does July 27 work for you? I THOUGHT you were one of the 5 Guys? Report back and let us know what you think of the Graeter's. I wish I could, but as it turns out my local Albertson's does not carry Graeter's. And never did. SHOCKINGLY, the internet 'lied'!